Many people complaints that despite of consuming lesser calories and doing moderate exercise, they tend to gain weight. Recent studies have identified various factors, other than diet habits, exercise pattern and genetics, which can increase weight. 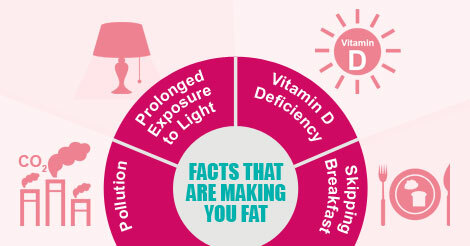 Studies performed at Oklahoma University found that reduced exposure to Sun causes vitamin D deficiency. Deficiency of vitamin D in the body confuse the brain and it evaluates the condition as reduced sunlight during winters. Thus brain signals for ‘winter metabolism’, which is increased fat storage and reduced metabolism of stored fat in the body which eventually leads to obesity. People who skips breakfast are 5 times more susceptible to gain weight than breakfast eaters. Metabolic rate of the breakfast skippers reduces on long- term and thus body starts to store more fat. Also, people to skip breakfast tends to eat more during lunch and thus intake more calories. It is surprising but true that your nocturnal habits of surfing or watching TV or even your night lamp are making you fat. While the phenomenon behind this fact is still not completely clear, but research at Ohio University suggest that nocturnal lights interfere with melatonin level secretion in the body and thus reduces metabolism to make you fat. A Canadian research found that increasing environmental levels of CO2 are bad for fit body too. Higher inhalation of CO2 present in the atmosphere has been linked to increased blood acidity which in turn increases appetite but reduce metabolism. Humans are not the only species to get fat due to pollution. Over 800 different species of animals have been researched and found to gain pounds due to increasing CO2 levels in air.